http://lastprophet.info/ received an international first prize on the first anniversary of its establishment. The Al-Mahabba Awards, organized under the patronage of the State President of the United Arab Emirates, Sheikh Muhammad bin Zayad al-Nahyan and presided over by the Prime Minister, Sheikh Abdullah bin Zayad, awarded lastprophet.info the first prize in the Mass Media category. 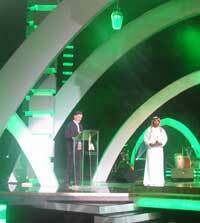 This year at the Al Mahabba (love) awards, which were organized for the first time in 2006 in Dubai and which determine, with the assistance of a jury, the most distinguished efforts expressing love for Prophet Muhammad (pbuh), 200 entries 28 countries participated. The prizes, which were announced at the end of the three-day festival held in the capitol of the UAE, Abu Dhabi, 24-26 April 2008, were awarded at a great ceremony in which those who had been invited many different areas participated. In order to eliminate the negative perceptions that have occurred, particularly in Western countries, against Islam and Muslims and to counteract the widespread fear of Islam that relies on prejudice and insufficient information there have been many different undertakings. The principle aim of these undertakings is to provide correct information and to establish communication on the basis of good intentions and tolerance with those people who have not had the opportunity to become acquainted with Islam or who have received misinformation about it. The Al Mahabba Awards, which were planned two years earlier, take as their basis the elimination of misconceptions, including the unfortunate caricature crisis, and bring together all activities that are carried out in different regions of the Islamic world. The awarding of prizes to the efforts that were exhibited in different areas during the festival will not only result in the encouragement of future undertakings and help to increase quality, but also acted as a means for bringing many people together. The main aims of the festival that was carried out under the patronage of the State President of the United Arab Emirates was to produce and display quality and artistic endeavors connected to Prophet Muhammad, to strengthen the ties of young Muslims to Prophet Muhammad, to open new doors, forming an esthetic platform on which love for the Prophet can be expressed, and to introduce the Prophet of Islam as an exemplary personage. In the contest the categories were books, music, advertising, film, photography, graphic arts, mass media, documentaries, television and the event of the year; in the 2006 contest very important works won prizes, for example Mustafa Akkad's The Message film won the film award, and Martin Lings' Muhammad won the book category. This year the activities were judged by a prestigious awards committee, headed up by Abdul Hakim Murad (Tim Winter), a lecturer Cambridge University Islamic Studies department. On the committee were also the Dean of the Theology Faculty of the Syrian Damascus University, Ramazan al-Buti, a famous Islamic scholar, and the founder of the Zaytuna Institute, Hamza Yusuf, as well as other important names the world of learning, arts, business and media, like Yusuf Ali, Hamdan al-Mazrui, Adbullah bin Bayah and Habib Ali al-Jifri. In the Man of the Year category for the Al-Mahabba awards the Dubai emir, Sheikh Muhammad bin Rashid al-Maktum was awarded the prize for his undertakings to open a museum that would inform the whole world of the message of Allah's final messenger, Prophet Muhammad (pbuh), showing how his life gave direction to world history and dealing with the turning points of Islamic history. Such a museum is the first of its type in history. During the three-day festival, in which artists the Islamic world participated, there were also conferences, art and photography exhibitions, film shows and concerts. In the conferences, in which academics and artists participated, the main theme was the relationship between art and religion and the esthetic opportunities this provides us. In the lectures that emphasized the nuances between religion, ideas and art it was stated that the relationship between art and religion is very ancient and that the arts are a positive force for people. Many of the artists and academics who participated in this program touched on the fact that artists and theologians coming together in one place was the means for the opening of a new page. Different musical atmospheres took to the stage during the three-day festival. From America was Native Deen, Malaysia Raihan, Australia Brotherhood, with other groups and musicians participating South Africa, France, Saudi Arabia, Egypt, the UAE, and Macedonia. Among the pictures and photographs on display in the hall where the activities were held were pictures expressing children's love for Prophet Muhammad and hadiths and hilye. The awarding of first prize to lastprophet.info at the Al-Mahabba Love Awards Festival added to the international recognition of the page. Throughout the festival an exhibition was opened to explain to visitors the foundation, aim and goals of lastprophet.info. The lastprophet.info project offers visitors information in Turkish, English or Russian and has a rich children's page; it is classified as one of the most meaningful undertakings in the Islamic world to have been carried out after the caricature crisis. At the same time attention was drawn to the fact that its aims are in keeping with that of the Al-Mahabba awards, which came out against the caricature crisis. Please type '975' into this field.